Birth*: She was born in 1609 in England. Marriage*: She married Dr. Robert Booth in England. Other Names*: Frances Booth, Frances Bouth. Marriage*: She married Edward Walton. Birth*: She was born in 1641 in York County, Virginia. Death*: She died in 1672 in York County, Virginia. Note*: Their descendants lived in New Kent, Albemarle, and Goochland Counties, Virginia. [S35] Gene Carlton Clopton, The Ancestors and Descendants of William Clopton of York County, Virginia (Atlanta, Ga.: Phoenix Printing, Inc., 1984), p. 222. [S206] Frederick A. Virkus, ed., The Abridged Compendium of American Genealogy, vol. 2 (Chicago, Ill.: F. A. Virkus & Co., 1926), p. 323 (naming Robert Booth, "many years clerk York Co., Va.," as her father). [S206] Frederick A. Virkus, ed., The Abridged Compendium of American Genealogy, vol. 2, above, p. 323 (no date or place). [S1336] Clopton Family Association Newsletter, vol. 31, no. 2 (May 2016), p. 4 ("The Booth Family") (not giving the date or place). Birth*: He was born circa 1634 in Edinburgh, Scotland. Death*: He died before 12 April 1669 in Goochland County, Virginia. [S206] Frederick A. Virkus, ed., The Abridged Compendium of American Genealogy, vol. 2 (Chicago, Ill.: F. A. Virkus & Co., 1926), p. 323 (no date or place). Birth*: She was born circa 1654 in York County, Virginia. Death*: She died circa 1711. Other Names*: Anne Bray Booth, Anne Booth. Marriage*: He married Angelica _____. Marriage*: She married James Bray. Marriage*: She married Benjamin Michaux Clopton, son of Benjamin Clopton and Agnes Morgan, on 7 February 1799. [S113] Arlene Bradley, information attributed to bible records from the estate of Benjamin Michaux Clopton (b. 1768), Clopton Family Newsletter (Feb 1986), p. 3. Birth*: She was born on 8 December 1799. Marriage*: She married Jonah H. Gipson on 31 January 1822. Marriage*: He married Mary Michaux Clopton, daughter of Benjamin Michaux Clopton and Adosha Glover, on 31 January 1822. Birth*: He was born on 22 May 1801. Birth*: She was born on 3 November 1802. Marriage*: She married Randolph Patterson on 22 May 1825. Marriage*: He married Judith Benning Clopton, daughter of Benjamin Michaux Clopton and Adosha Glover, on 22 May 1825. Birth*: He was born on 4 November 1804. Birth*: She was born on 2 November 1806. Birth*: She was born in 1808. Birth*: He was born on 5 March 1810. Birth*: He was born on 19 May 1814. Note*: He and Oliver were twins. Note*: He and Benjamin were twins. Marriage*: She married Capt. William Clopton, son of William Clopton and Joyce Wilkinson. Birth*: She was born in 1727. Death*: She died in 1785. [S1099] Wikipedia Online Encyclopedia http://en.wikipedia.org/wiki/Main_Page, s.v. "John Clopton," viewed on 7 Jan 2019 (naming Elizabeth Dorrell Ford as his mother). Note*: He was from Virginia and served in the U. S. Congress from 1795 to 1799 and from 1801 until his death in 1816. He was succeeded by John Tyler, who later became president of the United States. [S35] Gene Carlton Clopton, The Ancestors and Descendants of William Clopton of York County, Virginia (Atlanta, Ga.: Phoenix Printing, Inc., 1984), pp. 102, 113 (naming John Clopton as his father). [S114] Joyce Wilkinson Wallace, signed and sealed handwritten statement dated 9 Aug 1897, in John Bacon Clopton Papers, Duke Univ. Library, Durham, N.C., reprinted in Clopton Family Newsletter (April 1987), pp. 3-4 (naming Capt. William Clopton as his father). [S1099] Wikipedia Online Encyclopedia, above, s.v. "John Clopton," viewed on 7 Jan 2019 (naming Elizabeth Dorrell Ford as his mother). [S35] Gene Carlton Clopton, The Ancestors and Descendants of William Clopton [etc. ], above, p. 102. [S1099] Wikipedia Online Encyclopedia, above, s.v. "John Clopton," viewed on 7 Jan 2019. [S114] Joyce Wilkinson Wallace, 9 Aug 1897 statement, above (naming John Clopton as the grandfather of Joyce Wilkinson Wallace and John Bacon Clopton as her father). [S1099] Wikipedia Online Encyclopedia, above, s.v. "John B. Clopton," viewed on 5 Jan 2019 (naming John Clopton as his father). [S35] Gene Carlton Clopton, The Ancestors and Descendants of William Clopton of York County, Virginia (Atlanta, Ga.: Phoenix Printing, Inc., 1984), p. 102. [S35] Gene Carlton Clopton, The Ancestors and Descendants of William Clopton [etc. ], above, p. 102 (naming Sarah Bacon as his mother). Marriage*: He married Maria Gaitskell Foster on 4 May 1820. Note*: • His biography in Wikipedia contains conflicting information about his birth place, stating in one place that he was born in New Kent County, Virginia and in another that he was born in Cumberland County, Virginia. • He served in the Virginia militia in the War of 1812. • In 1818 he entered the College of William Mary. • He practiced law in Virginia, served i the Virginia senate for several years, and was a delegate to the Virginia Constitutional Convention of 1829-1830. • In 1834 the Virginia Assembly appointed him judge of the Seventh Judicial Circuit and from 1834 to 1851 he was judge of the General Court of Virginia. In 1851 he was appointed judge of the Sixth Judicial Circuit, and he served in that position until he died in 1860. [S114] Joyce Wilkinson Wallace, signed and sealed handwritten statement dated 9 Aug 1897, in John Bacon Clopton Papers, Duke Univ. Library, Durham, N.C., reprinted in Clopton Family Newsletter (April 1987), pp. 3-4 (naming John Clopton as the grandfather of Joyce Wilkinson Wallace and John Bacon Clopton as her father). [S1099] Wikipedia Online Encyclopedia http://en.wikipedia.org/wiki/Main_Page, s.v. "John B. Clopton," viewed on 5 Jan 2019 (naming John Clopton as his father). [S1099] Wikipedia Online Encyclopedia, above, s.v. "John B. Clopton," viewed on 5 Jan 2019. [S1099] Wikipedia Online Encyclopedia, above, s.v. "John B. Clopton," viewed on 5 Jan 2019 (first through sixth bullets). [S114] Joyce Wilkinson Wallace, 9 Aug 1897 statement, above (naming Judge John Bacon Clopton as her father). Marriage*: She married Judge John Bacon Clopton, son of Rep. John Clopton and Sarah Bacon, on 4 May 1820. Note*: She was described as "one of the celebrated housewives and entertainers of Virginia." Marriage*: She married _____ Wallace. [S114] Joyce Wilkinson Wallace, signed and sealed handwritten statement dated 9 Aug 1897, in John Bacon Clopton Papers, Duke Univ. Library, Durham, N.C., reprinted in Clopton Family Newsletter (April 1987), pp. 3-4 (naming Judge John Bacon Clopton as her father). Marriage*: He married Joyce Wilkinson Clopton, daughter of Judge John Bacon Clopton and Maria Gaitskell Foster. Marriage*: She married William Clopton, son of Walter Clopton and Mary Jarratt. [S35] Gene Carlton Clopton, The Ancestors and Descendants of William Clopton of York County, Virginia (Atlanta, Ga.: Phoenix Printing, Inc., 1984), p. 97. [S992] National Soc'y of the Colonial Dames of America in the State of Virginia, The Parish Register of Saint Peter's, New Kent County, Va. from 1680 to 1787 (Baltimore, Md. : Genealogical Pub. Co. 1966), p. 131 (naming Cassandra _____ as her mother). [S992] National Soc'y of the Colonial Dames of America in the State of Virginia, The Parish Register of Saint Peter's, New Kent County, Va. from 1680 to 1787, above, p. 140 (naming Cassandra _____ as his mother). Marriage*: She married William Perrin, son of Joseph Perrin and Rebecca _____. Note*: She and her sisters married brothers. [S35] Gene Carlton Clopton, The Ancestors and Descendants of William Clopton of York County, Virginia (Atlanta, Ga.: Phoenix Printing, Inc., 1984), p. 97 (citing Perrin family bible and St. Peter's Parish Reg.). [S992] National Soc'y of the Colonial Dames of America in the State of Virginia, The Parish Register of Saint Peter's, New Kent County, Va. from 1680 to 1787, above, p. 131 (naming Cassandra _____ as her mother). [S992] National Soc'y of the Colonial Dames of America in the State of Virginia, The Parish Register of Saint Peter's, New Kent County, Va. from 1680 to 1787, above, p. 131 (giving the date but not naming the place). Marriage*: He married Mary Clopton, daughter of William Clopton and Cassandra _____. [S35] Gene Carlton Clopton, The Ancestors and Descendants of William Clopton of York County, Virginia (Atlanta, Ga.: Phoenix Printing, Inc., 1984), p. 97 (citing Perrin family bible). [S747] Carol Randall, electronic mail to Roger Bartlett, 23 May 2002, (naming Joseph Perrin as his father). [S747] Carol Randall, electronic mail to Roger Bartlett, 23 May 2002, (naming Rebecca _____ as his mother). [S1162] e-mail address, electronic mail to e-mail address, 8 Feb 2005, (naming Joseph Perrin as his father). Marriage*: She married Joseph Perrin. [S1162] e-mail address, electronic mail to e-mail address, 8 Feb 2005, (naming Rebecca _____ as his mother). [S35] Gene Carlton Clopton, The Ancestors and Descendants of William Clopton of York County, Virginia (Atlanta, Ga.: Phoenix Printing, Inc., 1984), pp. 97, 104 (citing St. Peter's Parish Reg.). [S992] National Soc'y of the Colonial Dames of America in the State of Virginia, The Parish Register of Saint Peter's, New Kent County, Va. from 1680 to 1787 (Baltimore, Md. : Genealogical Pub. Co. 1966), p. 140 (naming William Clopton as his father). [S992] National Soc'y of the Colonial Dames of America in the State of Virginia, The Parish Register of Saint Peter's, New Kent County, Va. from 1680 to 1787, above, p. 140 (giving the date but not the place). [S35] Gene Carlton Clopton, The Ancestors and Descendants of William Clopton [etc. ], above, pp. 104, 114 (naming Walter Clopton as his father). Birth*: She was born in 1741. Marriage*: She married Josephus Perrin, son of Joseph Perrin and Rebecca _____. Marriage*: He married Cassandra Clopton, daughter of William Clopton and Cassandra _____. Marriage*: She married George Perrin, son of Joseph Perrin and Rebecca _____. Birth*: She was born in 1744. Marriage*: He married Catherine Clopton, daughter of William Clopton and Cassandra _____. Marriage*: She married Walter Clopton, son of William Clopton and Cassandra _____. [S35] Gene Carlton Clopton, The Ancestors and Descendants of William Clopton of York County, Virginia (Atlanta, Ga.: Phoenix Printing, Inc., 1984), p. 104. [S35] Gene Carlton Clopton, The Ancestors and Descendants of William Clopton of York County, Virginia (Atlanta, Ga.: Phoenix Printing, Inc., 1984), pp. 104, 114 (naming Walter Clopton as his father). [S35] Gene Carlton Clopton, The Ancestors and Descendants of William Clopton [etc. ], above, pp. 104, 114. [S35] Gene Carlton Clopton, The Ancestors and Descendants of William Clopton [etc. ], above, p. 114 (stating that they married before he was 21). [S35] Gene Carlton Clopton, The Ancestors and Descendants of William Clopton [etc. ], above, p. 114. [S35] Gene Carlton Clopton, The Ancestors and Descendants of William Clopton [etc. ], above, pp. 104, 114 (citing Wm. & Mary Quart. Mag., vol. IX, p. 70; History of Baptists of Virginia , p. 112; First Century of the First Baptist Church [Richmond, Va.], p. 160). [S115] "Virginia Cloptons Engage in Grave Search," Clopton Family Newsletter (April 1987), pp. 8-9, (citing plaque at Emmaus Baptist Church, New Kent County, Va.). [S35] Gene Carlton Clopton, The Ancestors and Descendants of William Clopton [etc. ], above, p. 114 (naming Rev. William Clopton as his father). [S35] Gene Carlton Clopton, The Ancestors and Descendants of William Clopton [etc. ], above, p. 114 (naming Rev. William Clopton as her father). Death*: She died in January 1816. [S35] Gene Carlton Clopton, The Ancestors and Descendants of William Clopton of York County, Virginia (Atlanta, Ga.: Phoenix Printing, Inc., 1984), p. 114. Birth*: He was born on 5 January 1782 in New Kent County, Virginia. Marriage*: He married Martha Winfrey on 5 August 1807. Note*: He succeeded his father as pastor of the First Baptist Church at Charles City County, Virginia. [S35] Gene Carlton Clopton, The Ancestors and Descendants of William Clopton of York County, Virginia (Atlanta, Ga.: Phoenix Printing, Inc., 1984), pp. 114, 129 (citing First Century of the First Baptist Church [Richmond, Va.], p. 160). Birth*: She was born on 15 July 1789. Marriage*: She married Rev. 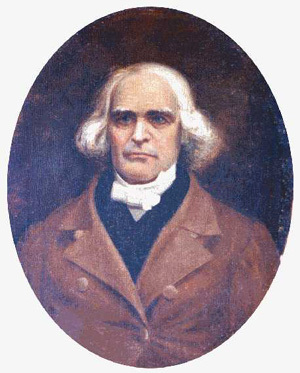 James Clopton, son of Rev. William Clopton and Elizabeth Clark, on 5 August 1807. [S35] Gene Carlton Clopton, The Ancestors and Descendants of William Clopton of York County, Virginia (Atlanta, Ga.: Phoenix Printing, Inc., 1984), pp. 114, 129. 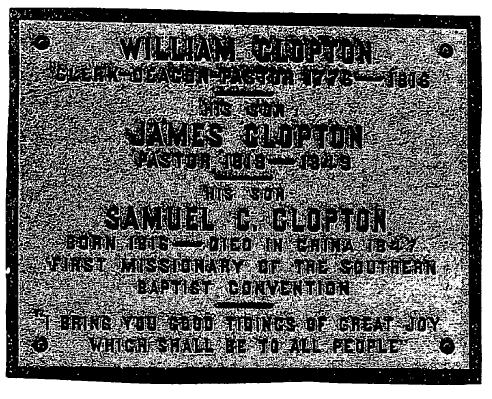 [S35] Gene Carlton Clopton, The Ancestors and Descendants of William Clopton of York County, Virginia (Atlanta, Ga.: Phoenix Printing, Inc., 1984), p. 114 (naming Rev. William Clopton as his father). Marriage*: She married Isaac Otey. Marriage*: He married Ann Clopton, daughter of Rev. William Clopton and Elizabeth Clark. Birth*: He was born on 28 November 1810 in Virginia. Marriage*: He married Elizabeth Brumly, daughter of William Brumly and _____ _____, on 28 November 1833. Marriage*: He married Lucretia Roberts, daughter of Zerubabel Roberts and Margaret Trower, in 1849. Note*: He was a neighbor and intimate friend of President John Tyler. [S35] Gene Carlton Clopton, The Ancestors and Descendants of William Clopton of York County, Virginia (Atlanta, Ga.: Phoenix Printing, Inc., 1984), pp. 129, 150.